If you’re about to have your second child, relax because we’re here to tell you that double doesn’t always mean trouble! 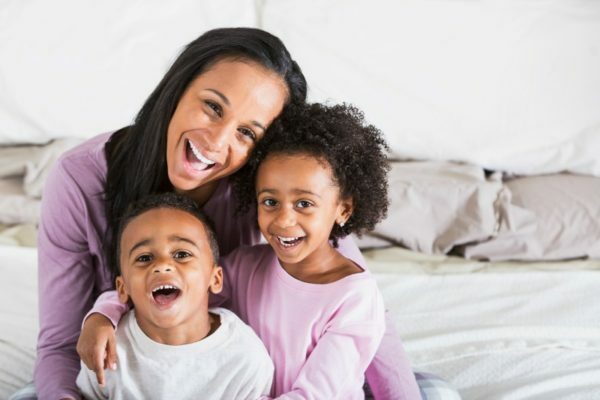 Here are eight ways that having two kids is a LOT easier than just the one. There’s no harder transition than going from childless to having kids. Becoming a parent is completely life changing so if you’ve done it before then you’ll already be one step ahead of the game once the second one comes along. Confidence and first-hand experience go a long way. And if your first babies are twins? Well, you’re certainly going to learn the ropes a whole lot faster than everyone else! Ahem. Okay so this doesn’t apply so much when your kids are the same age or close to it (e.g. 18 months apart), but if your gap is around three years or more then you’re in business. We’re not talking major tasks here like babysitting (unless you have a huge gap), but its the little things that can make a huge difference. Like having someone to hand you the wipes when you’re struggling to change a nappy, or hold your bag while you’re strapping the other one in the stroller. Having someone to fetch tissues / the remote / your phone when you’re breastfeeding is sooo handy too. When it comes to avoiding and deflecting tantrums, aches and pains, and complaints from fussy eaters, there’s nothing like a good distraction. And who better to help distract baby number two than their sibling? 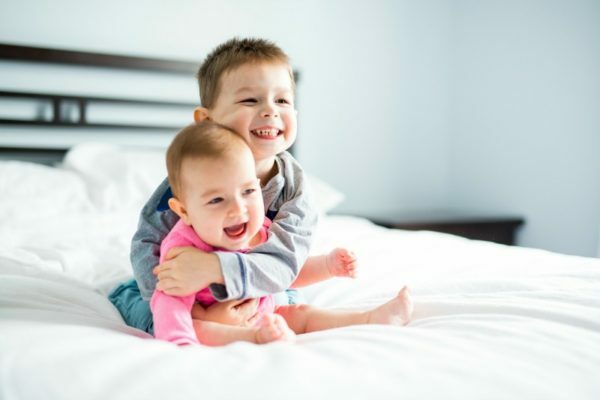 Younger kids will love listening to their big brother or sister talk or sing to them, and the older ones will be so fascinated with the new addition to the family. This one is the real golden nugget. Playing games and providing entertainment is no longer your job because your children now have each other. This means more time to get stuff done and perhaps even a bit of peace (until the fights break out). It really helps with things like travelling on aeroplanes and long road trips too. Scared of the dark? Maybe not so much if your children are sleeping in the same room as each other. Entering new situations like playgroups, daycare or sports lessons is nowhere near as scary when you have a pal to go along with or one who is already there. It’s not always the case, but many younger siblings are faster to crawl, walk, talk and do other things like draw, use cutlery and be toilet trained. This is because they’ve had another child to watch or teach them, which makes it less of a job for you. If you can’t find that special teddy bear of number two’s, there’s a very good chance that number one has clocked it for you. Kids have this knack of knowing each other’s stuff in detail, like which teensy LEGO man accessory goes with what, and where the dolls go on the shelf. So finding things like water bottles and clothes, or sorting out their toys and games is a darn sight easier with a wingman. It’s important to remember that young siblings are not babysitters, but they can be really helpful as an extra lookout on the safety front. For example if one of them falls in the garden, is about to choke from putting something in their mouth, or has run away in the supermarket; the other one can try and stop them or run and tell you. See! Two having two kids is pretty handy after all. Did you find two kids easier or harder than one? Share your experience with us on Facebook!